A new general took the helm of one of the military's most legendary training bases Friday, just days after it was rocked by a string of high-profile firings following a recruit's death there. Brig. Gen. Austin Renforth, a career infantry officer, took command of Marine Corps Recruit Depot Parris Island, South Carolina, on Friday. 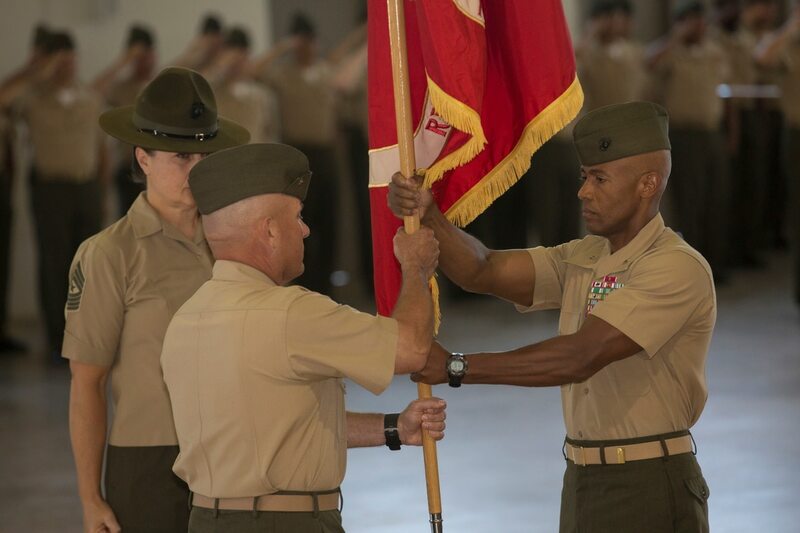 Renforth, who previously led the service's Training Command, pledged that Marines in his charge will "follow the rules" and "do things right," the South Carolina-based Island Packet reported. Renforth replaced Brig. Gen. Terry Williams, who led the fabled recruit depot for two years. During that time, four Marines there were removed from top leadership positions. Two of those reliefs were tied to the investigation into the March death of Raheel Siddiqui, a 20-year-old recruit who fell 40 feet from a balcony just days after arriving at boot camp. An undisclosed number of drill instructors have also been removed from their jobs as a result of Siddiqui's death, the Washington Post reported Friday. There's concern that the wave of firings could have a chilling effect on the depot's remaining drill instructors, who must work within a strict set of guidelines while molding the recruits into Marines. They are not allowed to hit or otherwise abuse the young men and women whom they train, of course, but out of necessity their interaction can be up-close, intense and aggressive. It's a delicate balance, and the system has been refined over the last several years as more scrutiny has fallen on longstanding practices that bordered on hazing — or fit the very definition of it. 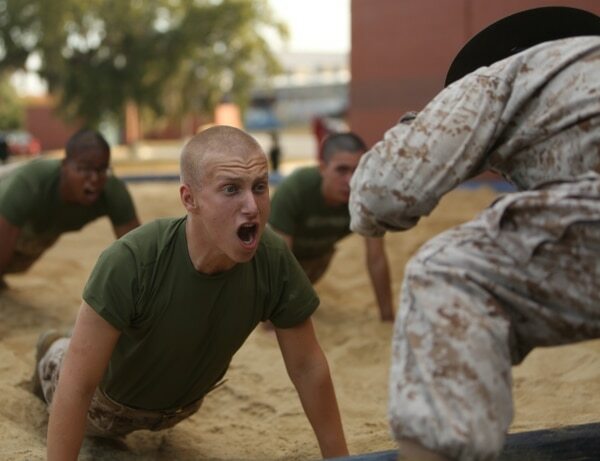 "The DIs are going to be walking on eggshells, worried if they do this or that they'll get in trouble, and we don't want that," said one observer, a retired senior enlisted Marine with several tours in the service's recruit training environment. He implored Parris Island's new chain of command to have an honest conversation with the depot's staff about the impetus for the recent firings, so they trust that they can do their jobs without having to "look over their shoulders." Recruits respond to a drill instructor's commands during incentive training at Marine Corps Recruit Depot Parris Island, S.C. Incentive training is a disciplinary tool reserved for the recruit depots where drill instructors have set of specific exercises they can command a recruit to complete in order to correct minor infractions. "The perception can be that all of the drill instructors are messing up, and that's why leadership is being relieved," he said. "That's the last thing we want. I'm confident the Marine Corps' leadership will continue to give those DIs the confidence to continue to train recruits by [standard operating procedures], to ensure the right individuals are earning the title and the eagle, globe and anchor." The high-profile Parris Island command was Williams' first assignment as a full-fledged general officer. An engineer by training, he'd been selected for promotion several months prior to his arrival in South Carolina, and before being parked for a brief stint at the Pentagon where he served as the service's director of public affairs and worked closely with then-commandant Gen. James Amos. While in the public affairs role, Williams became involved in Amos' controversial effort to remove Marine Corps Times newspapers and newsstands from their sales locations at Marine Corps exchange stores worldwide. 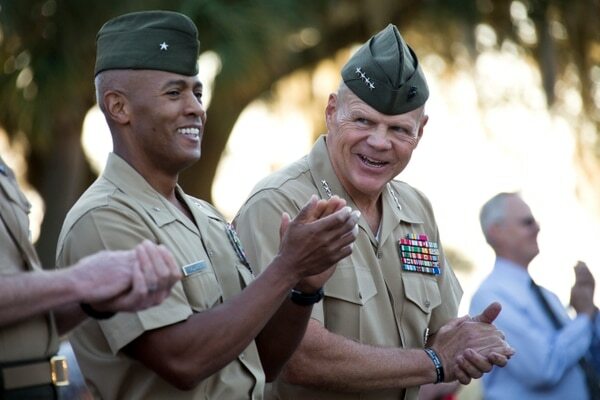 Commandant Gen. Robert Neller, right, and Brig. Gen. Terry Williams, watch a morning colors ceremony at Marine Corps Recruit Depot Parris Island, S.C. Neller visited the recruit training depot in October to outline the service's priorities and expectations after he became commandant. The general did not immediately respond to questions from Marine Corps Times about his time at Parris Island or his advice to Renforth as he takes the helm of a base that's still reeling from a rash of firings. The Marines whom Williams relieved of command declined to comment or didn't respond to requests for comment. In June 2015, about a year into his tenure at Parris Island, Williams fired Lt. Col. Kate Germano, the commanding officer of the Marine Corps' only all-female recruit training battalion. Williams, a spokesman said, lost confidence in her ability to lead after an investigation determined she allegedly created a toxic work environment — a claim that she and her supporters dispute. The incident festered into a public relations crisis for the service's leadership, who were embroiled in the controversial military-wide debate over lifting the ban on women serving in ground combat units. The flap drew unwanted attention to the Marine Corps' gender-segregated boot camps, its performance standards for women and how those divides affect personnel in the fleet. It also touched off a media firestorm that cast the service in a negative light, and created a public rift between its uniformed leaders and their civilian boss, Navy Secretary Ray Mabus. About a month later, a complaint was made to the Marine Corps Inspector General's hotline about Lt. Col. Joshua Kissoon, the commanding officer of Parris Island's 3rd Recruit Training Battalion. An investigation was launched and the results were delivered Feb. 29 to Kissoon's commander, Col. Paul Cucinotta, the former head of Recruit Training Regiment, said Capt. Gregory Carroll, a spokesman for the recruit depot. About two weeks later — the day before Saddiqui would fall to his death — Cucinotta informed Williams "of his intent to relieve Lt. Col. Kissoon," Carroll said, "and the culmination of that determination occurred on March 31." Parris Island officials have stressed that Kissoon's relief was not tied to Saddiqui's death. Cucinotta would then be dismissed Monday after the investigation into Saddiqui's death found instances in which proper policies and procedures were not followed. His top enlisted adviser, Sgt. Maj. Nicholas Deabreu, was also fired then. A congresswoman is pressing the Marine Corps to ensure that hazing was not a factor in Saddiqui's death. Those latest two reliefs were carried out by Maj. Gen. James Lukeman, the head of the service's Training and Education Command, which oversees both of the Marine Corps recruit depots. It's not immediately clear who removed the drill instructors from training duty following the recruit's death. Lukeman took oversight of the investigations because he was concerned about them being conducted thoroughly and objectively, said Capt. Joshua Pena, a spokesman for Training and Education Command. However, observers question Lukeman's decision to pull rank, suggesting it could indicate that he — or other more-senior generals — either didn't trust Williams or lacked confidence in his leadership abilities. Williams, who is slated to return to the Pentagon for his next assignment as the assistant deputy commandant of Installations and Logistics, referenced Cucinotta's leadership of Recruit Training Regiment during Friday's change of command. Cucinotta attended the ceremony, according to the Island Packet. "His service was noted," Williams said, according to the paper. "You're a professional and a real honorable man, so thank you." Renforth, a prior-enlisted sailor and former member of the Marine Corps' rugby team, has led infantry platoons in Afghanistan and Iraq — during Desert Storm and Operation Iraqi Freedom. He commanded 7th Marine Regiment during a combat tour in Afghanistan and 2nd Light Armored Reconnaissance Battalion during two deployments to Iraq. He also led a maritime special-purpose force during a sea deployment with the 31st Marine Expeditionary Unit. 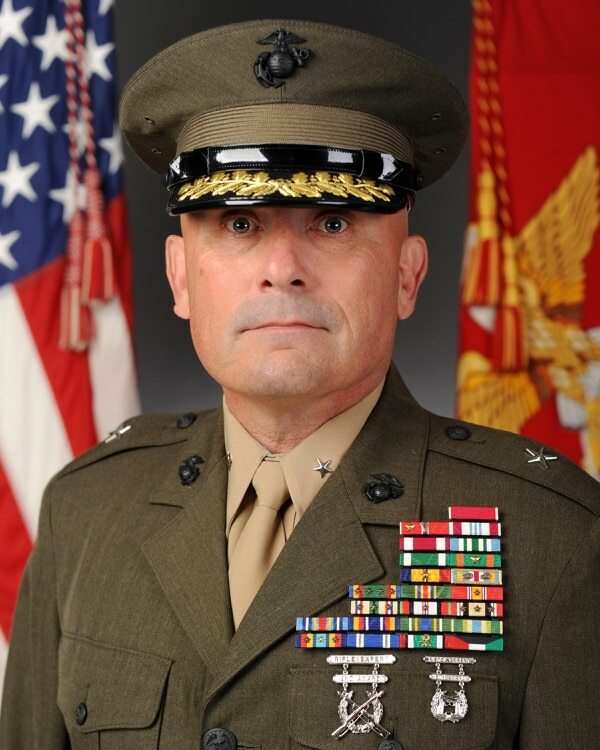 Renforth has served with U.S. Northern Command's special-plans branch and as 1st Marine Division's chief of staff. He is a Naval Academy graduate, where he coached sprint football and men's rugby. He is married with five children. Gina Harkins is the editor of Marine Corps Times. She oversees reporting on Marine Corps leadership, personnel and operations. She can be reached at gharkins@marinecorpstimes.com. Andrew deGrandpre is a senior editor with the Military Times group. He oversees enterprise reporting and investigations. He can be reached at adegrandpre@militarytimes.com.